Brad Hunter led the redesign of the original iWALK handsfree crutch which helps people who have lower leg issues. The improved iWALK 2.0 went on to secure a first place honour in Medica Expo’s i-NOVO Awards. Notably, the number of people needing crutches because they’ve had a diabetes-related lower leg amputation is increasing. Diabetes UK says that there were 26,378 diabetes-related lower leg amputations in the UK between 2014 and 2017, 19.4% more than in the 2010 to 2013 period. In North Somerset – where Peglegs is based – the picture is worse. According to recently released North Somerset Clinical Commissioning Group figures there were 31% more diabetes-related lower leg amputations during the 2014 to 2017 period compared to the previous period. Many people who have had a diabetes-related lower leg amputation have found the iWALK 2.0 hands-free crutch has helped them, either on a temporary basis or as a permanent alternative to a prosthetic limb for people who are unable to use such limbs. The iWALK 2.0 hands-free crutch is better than conventional crutches because its hands-free design means that you can still use your arms. With conventional crutches even a relatively simple task such as carrying a mug of tea from your kitchen into your living room would be difficult, but with the iWALK 2.0 this is no longer a problem. You can even walk your dog, or hold your children or grandchildren. But importantly, Mr Hunter says that as well as giving you increased mobility and freedom, there are medical reasons why hands-free crutches are better for you. First, conventional crutches don’t just affect your hands and shoulders while you’re using them. Your upper leg and hip muscles can atrophy by as much as 2% a day while on crutches. You don’t experience this level of muscle loss with the iWALK 2.0. Second, using conventional crutches restricts the blood flow to your lower extremities. Diabetes often leads to damaged blood vessels as a result of high blood sugar levels so anything that restricts your blood flow is bad news. Using the iWALK 2.0 rather than conventional crutches helps with this. You can find out more about how the iWALK 2.0 hands-free crutch helps lower leg amputees here. Steven is thrilled with his iWALK 2.0 and so are his family, who seem to have come out in sympathy with him. He ordered it on Friday and it was with him on Saturday. It costs a bit more than our normal next working day delivery service, but some people just can’t wait. Author Jerry JonesPosted on June 10, 2018 Categories UncategorizedLeave a comment on Another Happy Customer! For those of you who follow Real Housewives of Orange County, I see from her Instagram, kindly pointed out by a customer, that Tamra Judge has discovered the joys of the iWALK 2.0. If you are a social and fashion icon with a broken foot or ankle, you now know what to do! 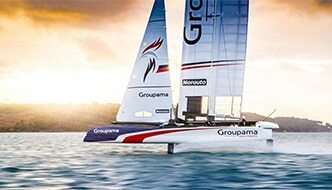 The new America’s Cup catamarans sail four times faster than the wind by literally flying over the water. When French skipper Franck Cammas was knocked overboard during training, he almost lost his lower leg. He needed to get back into training in time to compete for the cup, so naturally he wanted the best, most technologically advanced crutch in the world. 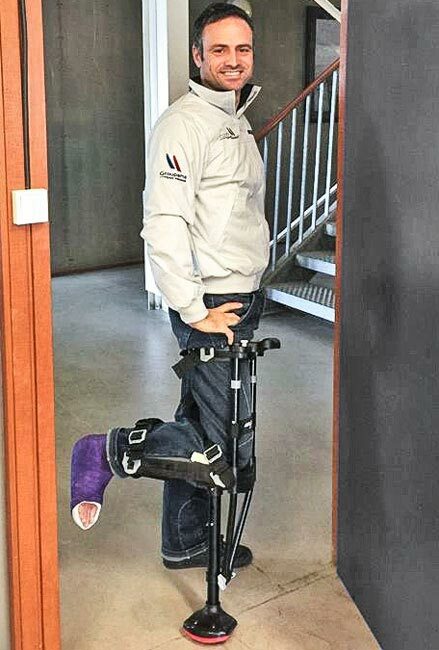 That’s why he chose the iWALK2.0, which we the fellow sailors at Peglegs UK sent to his training base in France. In June, France successfully competed in the America’s Cup Challenger series in their quest for the cup. Lots of people ask us if they can use an iWALK 2.0 for walking their furry best friends when they are on crutches with a lower leg injury. Here’s how it works! We are coming across a number of Achilles rupture patients who are being offered a trial which involves being in an air boot from the beginning so they do not actually need to be non weight-bearing and wish to return their iWALK 2.0. This costs us a considerable amount, so please check before you buy! You definitely can’t drive a car with a manual gearbox and foot clutch using an iWALK but what this video shows is how easy it is to remove the iWALK 2.0 and get into the driving seat of a large American car with automatic transmission. Putting it back on is the reverse of this operation and takes a similar time.